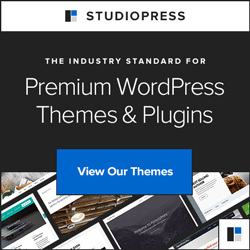 iThemes, the makers of the great BackupBuddy plugin for WordPress sites, offers a number of useful plugins. 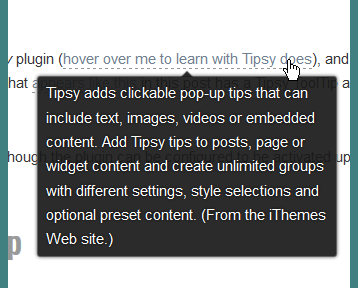 One that I just downloaded and installed is Tipsy (yeah, hover over me to learn with Tipsy does), and this post is a test of how it works. Note that anything that appears like this in this post has a Tipsy ToolTip associated with it. 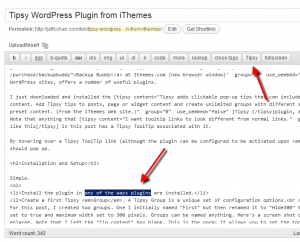 By hovering over a Tipsy ToolTip link (although the plugin can be configured to be activated upon click, instead), the tool tip should pop up. Installation and setup is very simple. 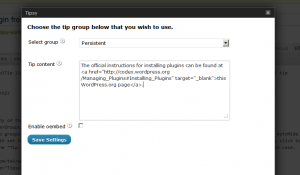 Install the plugin in any of the ways plugins are installed. Create a first Tipsy Group. A Tipsy Group is a unique set of configuration options. For this post, I created two groups. One I initially named “First” but then renamed it to “Hide300” to help me remember that it has auto hide set to true and maximum width set to 300 pixels. Groups can be named anything. 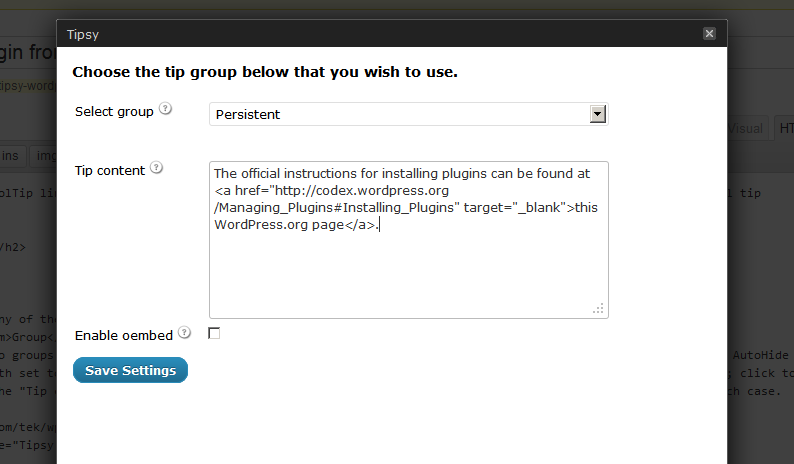 Here’s a screen shot of the Tipsy Group Setup screen; click to enlarge. Note that I left the “Tip content” box blank. This is the norm; it allows you to set the tooltip text independently for each case. 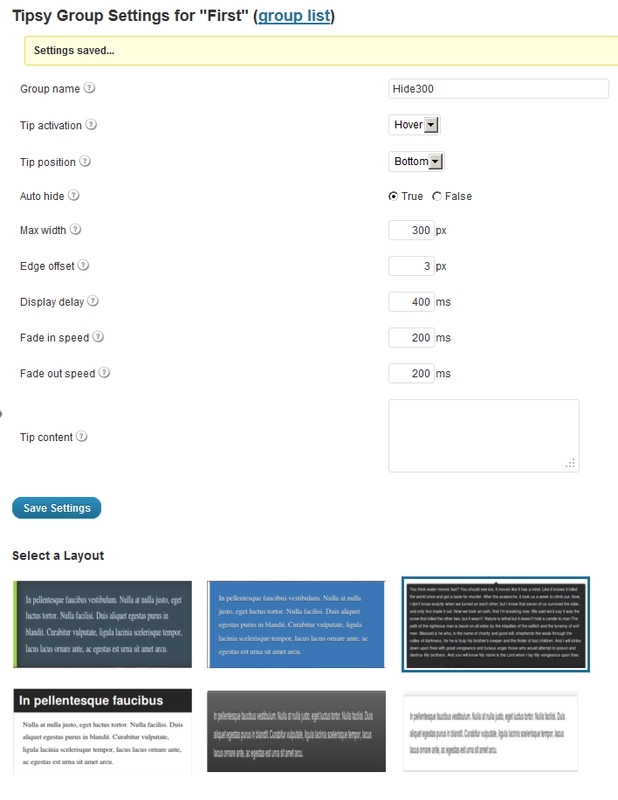 Note that the screen shots show the “HTML” view. 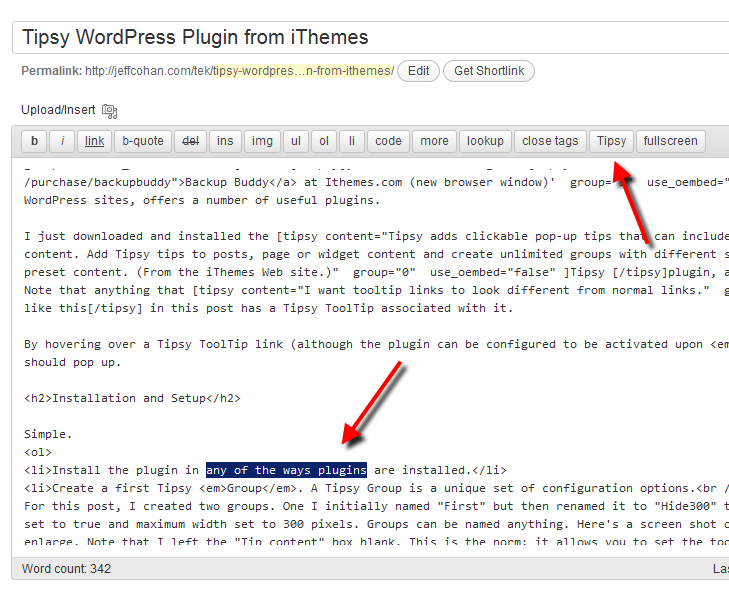 Highlight the segment of your post to which you want to associate a tool tip, and click the “Tipsy” toolbar in your editor. Enter the content and click “Save Settings”. Warning: When entering content that includes quotation marks (such as the hyperlink in the above example), you’ll have to manually replace the double-quotes that embrace the content element of the short code with single-quotes. I’ll be doing further testing — including entering Tipsy tooltips in Visual mode; and I’ll report back. I like this one. 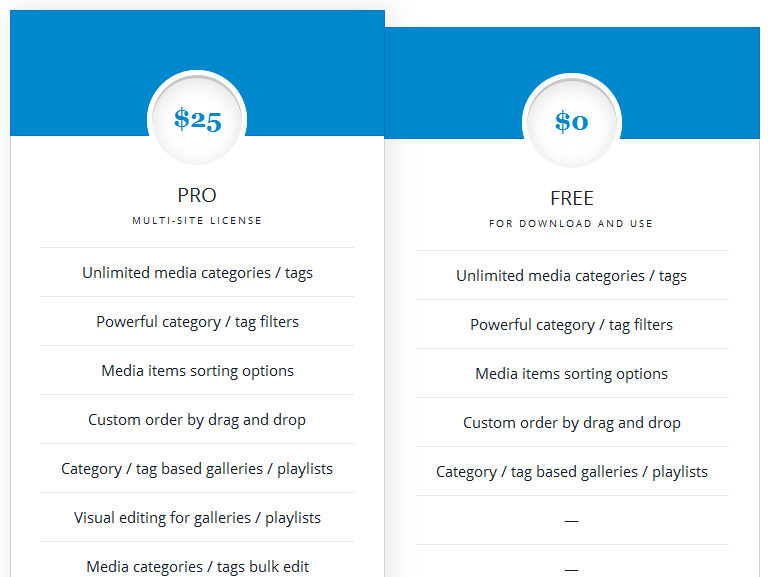 Might it encourage one to go a little crazy with tooltips &#8212 when, perhaps, more conventional methods for adding auxilliary content might be more appropriate? Sure. 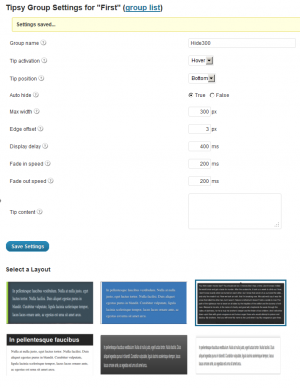 But this little plugin offers a simple solution for something that can make your Web site a little more interesting and engaging. Comments or questions? Feel free to post below.